Dalai Lama: Chinese Rule in Tibet "Hell on Earth"
Chinese martial law, and hard-line policies such as the Cultural Revolution, devastated the mountain region and left hundreds of thousands of Tibetans dead, the Dalai Lama said, blasting the "brutal crackdown" in the region since protests last year turned violent. China has overseen a "brutal crackdown" in Tibet since protests shook the Himalayan region last year, part of decades of Chinese oppression that have driven Tibetan culture to the verge of extinction, the Dalai Lama said Tuesday. The Tibetan spiritual leader made the comments in a speech to mark the 50th anniversary of the failed uprising that sent him into exile. "Even today, Tibetans in Tibet live in constant fear and the Chinese authorities remain constantly suspicious of them," the Dalai Lama said in this Indian hill town, where he and the self-proclaimed government-in-exile have been based since shortly after fleeing their homeland. "The Tibetan people are regarded like criminals, deserving to be put to death," he said. Chinese martial law, and hard-line policies such as the Cultural Revolution, devastated the mountain region and left hundreds of thousands of Tibetans dead, he said, blasting the "brutal crackdown" in the region since protests last year turned violent. He told a group of about 2,000 people, including Buddhist monks, Tibetan schoolchildren and a handful of foreign supporters, that the religion, culture, language and identity of successive generations of Tibetans faced "extinction." The group had gathered in a courtyard that separates the Dalai Lama's home from the town's main temple; monks blew enormous conch shells and long brass horns to herald his arrival. While his comments were unusually strong for a man known for his deeply pacifist beliefs, he also urged that any change come peacefully and reiterated his support for the "Middle Way," which calls for significant Tibetan autonomy under Chinese rule. "I have no doubt that the justice of Tibetan cause will prevail if we continue to tread a path of truth and nonviolence," he said. Later, at a press conference, he said he'd become deeply discouraged about repeated rounds of failed talks between his representatives and Beijing. "We have to prepare for the worst. At the same time, we should not give up our hope," he said. Chinese Foreign Ministry spokesman Ma Zhaoxu said he would not comment on the Dalai Lama's statements, dismissing them as lies. 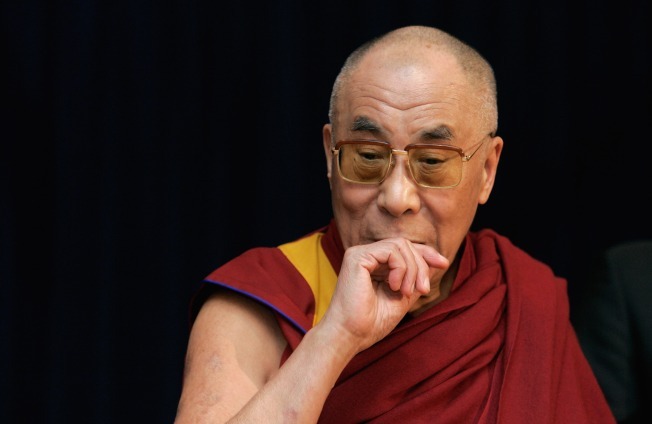 "The Dalai group confuses right and wrong and spreads rumors," he said. After the Dalai Lama's speech, thousands of young Tibetans took to the streets of Dharmsala chanting "China Out!" and "Tibet belongs to Tibetans!" About 1,000 more protesters marched peacefully through New Delhi in support of the Tibetans, many chanting "Shame on China!" Still more protested in Seoul and Canberra, the Australian capital, where they scuffled with police outside the Chinese Embassy. Four of about 300 protesters were arrested there. In Nepal, home to thousands of Tibetan exiles, police blocked about 100 Tibetans who demonstrated on the outskirts of the capital, Katmandu. The area around the Chinese Embassy was blanketed with more policemen, and the government banned protests in the area. The government also increased security along the Chinese border. While Beijing claims Tibet has been part of Chinese territory for centuries, Tibet was a deeply isolated theocracy until 1951, when Chinese troops invaded Lhasa, the regional capital. Tuesday's anniversary marked March 10, 1959 riots inside Tibet against Chinese rule which lead to a crackdown and, later that month, the Dalai Lama's dramatic flight across the Himalayas and into exile. Beijing has long claimed that it brought modernity to a region where monks and wealthy landowners had long ruled over huge tracts of land worked by slaves and serfs. Ma, the Chinese official, said Tibet went through democratic reform in 1959, and that Tibetans had been freed from slavery. "People's livelihoods have been greatly improved," he said. But Tuesday, the Dalai Lama dismissed such claims, saying most of the development in the last 50 years was designed to make Chinese rule easier, and came at "the huge cost of devastating the Tibetan environment and way of life." Last year, a peaceful commemoration of the 1959 uprising by monks in Lhasa erupted into anti-Chinese rioting four days later and spread to surrounding provinces — the most sustained and violent demonstrations by Tibetans in decades. This year, China has largely sealed off Tibet to the outside world. Recent visitors to Lhasa have described armed police posted on rooftops. Local governments in Tibetan areas have ordered foreign tourists out, and foreign journalists have been detained and told to leave. Internet and text-messaging services, which helped spread word of last year's protests, have been unplugged in parts of the region. Following the protests, China has stepped up its campaign to vilify the Dalai Lama, accusing him of leading a campaign to split the region from the rest of the country. The Dalai Lama insists, though, that he does not want Tibetan independence, saying he is only seeking greater autonomy for the region to protect its unique Buddhist culture.